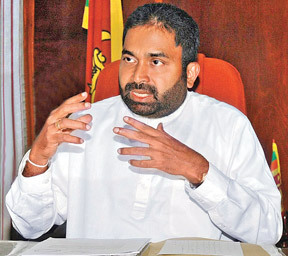 Telecommunications and Information Technology Minister Ranjith Siyambalapitya said the Government’s expenditure has increased in the 2012 Budget, with the intention of taking the country forward. It also contains a series of relief measures which are expected by the people. The Minister in an interview with the Sunday Observer said according to the information received and the Appropriation Bill which has been presented the Government through the budget is ready to make the biggest-ever expenditure for 2012. Of this expenditure the majority of the money has been allocated as capital expenditure and it would be over 50 percent of the total expenditure of Rs. 2,220 billion. Relief given to the people, has not been curtailed in the upcoming Budget. The Minister said when an analysis is made, living standards of the people have gone up. Salaries for public servants have been increased. Income for the paddy farmers, tea small holders, rubber small holders and Samurdhi beneficiaries have also been increased. The percentage of those who live below the poverty line which was over 25 percent in 2002 has come down to eight percent at present. If there is no improvement in the living standards of the people, poverty cannot come down to eight percent. I don’t say we have performed 100 percent in all the sectors, but taken as a whole, the country has been able to reach a good position. He said the Revival of Underperforming Enterprises and Underutilised Assets Act will not have any adverse effect on any private sector industries or entrepreneurs as claimed by the Opposition. Only 37 underperforming industries have been named in this Act. Taking over these underperforming industries is an encouragement to investors who have the ability to move forward through proper management skills in keeping with the requirements of the country. Q: As far as the budget is concerned since costs are heavy what kind of relief would the Budget offer? A: I have no ability to comment on the relief measures to be given to the people in the Budget. According to information received and the Appropriation Bill the Government is ready to for the largest expenditure for 2012. Of this total expenditure, majority of the money will be for capital expenditure. This would be over 50 percent of the of Rs. 2,220 billion total expenditure. I would say the Budget has also not reduced or curtailed any relief given to the people. Capital expenditure is needed when a country is moving forward. However, people expect to safeguard subsidies or increase them further. Public servants also expect a pay hike. At the moment, I am not in a position to comment how salaries or other benefits will be increased singularly. But as a whole there is a significant change in expenditure compared with the previous year. Recurrent expenditure will also exceed Rs. 1,000 billion. The Budget has increased expenditure with the intention of going on a long journey while containing a series of relief measures which are expected by the people. Q: The Opposition warns the Government against a possible debt crisis, citing the economic melt-down that affected East Asian countries some time ago. Is there any truth in this? A: Certainly not. The Government overcame so many economic challenges in the past, which were much worse than this. When I was Deputy Finance Minister, I witnessed severe economic challenges faced by the country in 2008, similar to the situation in 1988-1989. The 2008, economic recession was the biggest economic challenge faced by the country. At that time, Sri Lanka faced this recession,in addition to a war against terrorism. Therefore, we are a country that has experienced the impact of both these challenges simultaneously. After Sri Lanka gained Independence, we have not faced such an economic recession. The Government can face a this challenge due to the sound economic policies adopted. The country is in a very stable position. Now we have foreign reserves of over US$ 6 billion. Most of our loans obtained in 2002-2003 as a percentage of the Gross Domestic Production (GDP) has come down to 86 or 87 percent. Nobody can say that the Government is in a debt trap. The Government has entered a successful journey of taking the country forward. Q: Critics allege that despite an economic growth of 8.2 percent, living standards of the people have gone down resulting from escalating prices of goods. Would you explain the implications? A: According to the principles of Economics, we can talk on a different angle about various sectors of society. In Economics, it is not difficult to find some plus point to build these arguments. But when we analyse it as a whole, living standards of the people have gone up. Salaries were increased for the public servants, the income to paddy farmers, tea small holders, rubber small holders and Samurdhi beneficiaries have also increased. The percentage of those who live below the poverty line which was over 25 percent in 2002 has come down to 8 percent. If there is no improvement of the living standards of the people, the country’s poverty levels cannot be reduced to eight percent. I don’t say, we have performed 100 percent okay in all the sectors, but as a whole we have been able to reach a good position. Q: Now look at the Revival of Underperforming Enterprises and Underutilised Assets Act, which the Opposition has dubbed as the Expropriation Act. Will this deter foreign investments as alleged by the Opposition? A: This Act will have no adverse effect on any private sector industry or entrepreneur as claimed by the Opposition. Only 37 underperforming industries have been named in this Act. All these institutions belong to the Government and had been vested with the private sector far a certain period. A series of concessions had been given to these industries but they have failed to show any progress. Therefore, taking over these under performing industries will not have an adverse effect on any private sector industry. The Government has named these 37 loss making industries. This has provided the opportunity for any capable private investor to take over these institutions as well. Therefore, I see this move as an encouragement given to investors who have the ability to move forward through proper management in keeping with the requirements of the country. Q: Foreign aid is an important component for development. Is there any shortage of foreign aid from traditional sources due to alleged human rights violations? A: These human rights allegations have had no impact on the flow of foreign aid. But there is a change of traditional aid and loans. One of the key reasons for this situation, is that the country is not in the position it was ten years ago. Being a third world country, we were very backward. The country has now reached a stable position gradually. Today, we are a country which has the potential to successfully exceed its per capita income to over US$ 2000. It is natural that the change of composition of some countries and other international monetary agencies which provide aid and loans to a country like Sri Lanka. But we are focusing attention on other countries, financial agencies and the open market for financial aid. This is normal and an emerging country has to face the situation. It is not because of any fault of the Government or alleged human rights violations levelled by NGOs or the Tamil diaspora. Q: Considering the billions spent on the Southern Expressway, what benefits specially in monetary terms will acquire to Government coffers? A: This is the first Expressway to be opened in Sri Lanka. As interpreted in Economics, Expressways are considered as one of the key sectors of an economy. The Southern Expressway would be of great assistance towards the attempts made by the Government to take the country forward. It would bring immense benefit to the economy. Q: What benefits can be expected to the telecom sector in amounting of work for the Budget? A: President Mahinda Rajapaksa has vested a large the telecommunication sector. The Ministry in collaboration with telecommunication sector and information technology institutes intends to double the existing computer literacy rate and to increase the IT sector employment by another 200,000. Arrangements have also been made to turn income gained from computers to US$ 2,000 million. We wish to see everybody using computers in the future. To achieve these targets, we have a four or five year time frame. I think this 2012 Budget has created the necessary environment needed for us to commence this journey. We can talk about it on November 21. Q: What are the Government’s plans to expand information technology and broadband internet to all areas? A: We will facilitate and expand these two sectors. This Ministry was created by combining the telecom and ICT sector. We hope to provide more facilities and more equipment to these institutions. We have also focused attention on a methodology to provide easy internet facilities to the people at affordable rates. Computers are being used more and more, we intend to utilise the computer as a key income source to the country by saving a large amount of money which goes out of the country at present. The Ministry in association with experts will prepare a special report to decide on targets to be achieved by us within the next five years. It will be submitted to Cabinet and we will move forward based on that report. We will provide this report to the media and also create a dialogue with the people to educate them on the facilities to be given to them and changes to be made in this sector. Q: Sri Lankans use nearly 17 million mobile phones, out of a population of 21 million. What kind of Government policy led to this huge mobile penetration? A: The main reason is that the Government has been able to create an atmosphere where people can use mobile phones at very affordable rates. The Government created an open competitiveness in the market on mobile phones without having a monopoly. These two factors helped the people to easily buy and use a mobile phone at affordable rates. When there is rapid economic development, there is some sort of cash exchange among the people. If the people are not in a position to meet their daily requirements, whatever competition is made in the market or reduction of prices of mobile phones would not enable them to buy a mobile phone. People are able to buy mobile phones as their purchasing power has increased. Q: What is the Government’s plans for the telecom sector in the coming years? A: We have laid emphasis to provide more facilities to the telecommunication sector. We want to expand internet facilities throughout the country. The Government has decided to utilise more than 25 percent of the tax income gained from the telecom sector, to provide more internet facilities to remote areas. Special attention has also been focused to provide telecom facilities to the North and East provinces as well. We hope each area in this country will be equipped with internet and telecom facilities within the next two or three years due to this commitment made by the Government. Q: There are some places which offer very cheap overseas calls using internet and skype facilities. Is there anything that can be done to stop such revenue losses in this technology driven age? A: Definitely. The Telecommunication and Information Technology Ministry is in its infancy. Once this Ministry was established, we formulated a report by specifying targets to be achieved by this Ministry. The report has also mentioned how to recover money that has been lost to the Government. The Ministry will take necessary steps in this regard shortly. Q: Are any more licences being granted for cellular and other telecom services in Sri Lanka? A: I can’t give a definite reply to this question. Because it depends on present day needs. Today’s need may change tomorrow. We are ready to take decisions in keeping with these changes. We always see the importance of implementing a flexible policy in this sector. Q: With the impending switchover of TV and radio broadcasts to digital technology, has the Government decided what to do with the analog frequencies which will be vacant? Will they be auctioned off like in some other countries? A: Certainly. We are a country which faced three decades of terrorism. Sometimes we had to follow strict rules and regulations due to the security situation in the country. Today we have been able to lift some of those regulations and act in a free and fair manner. In future, we hope to address this issue in a more systematic and advantageous manner.